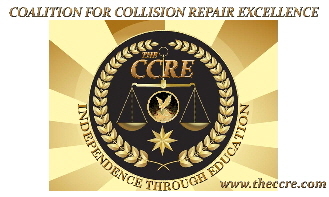 the CCRE was founded in 1995 by a group of collision repairers who wanted to excel in the repair of damaged vehicles and wanted to assist consumers in receiving a quality and proper repair without third party intrusion in the process. Carolyn and Phil Rack, publishers of Beyond Parts and Equipment and consumer advocates, were also part of our founding team. The CCRE has provided our sponsors with a great level of assistance in helping repairers and consumers receive what they are entitled to. We continue to strive to maintain integrity and excellence for our sponsor members.. Our commitment to excellence has earned us the reputation of one of the driving forces in the collision repair industry. While the identity of our Sponsor Members remains closely protected, our efforts and methods are clear for all to examine. Visitors may access information by prompting the text links above. Enjoy your visit and feel free to contact us with any questions, comments or suggestions you may have. Visitors may use the following links to familiarize themselves with the CCRE organization.